1 CORINTHIANS 10:31 KJV "Whether therefore ye eat, or drink, or whatsoever ye do, do all to the glory of God." 28But if any man say unto you, This is offered in sacrifice unto idols, eat not for his sake that shewed it, and for conscience sake: for the earth is the Lord's, and the fulness thereof: 29Conscience, I say, not thine own, but of the other: for why is my liberty judged of another man's conscience? 30For if I by grace be a partaker, why am I evil spoken of for that for which I give thanks? 31Whether therefore ye eat, or drink, or whatsoever ye do, do all to the glory of God. 32Give none offence, neither to the Jews, nor to the Gentiles, nor to the church of God: 33Even as I please all men in all things, not seeking mine own profit, but the profit of many, that they may be saved. Whether therfore ye eat or drinke, or whatsoeuer ye doe, doe all to the glory of God. So then, if it is a question of food or drink, or any other thing, whatever you do, do all to the glory of God. 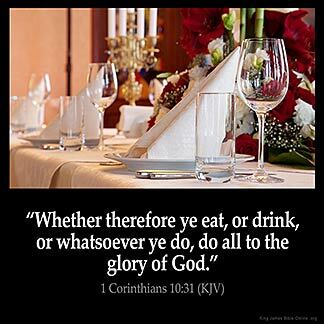 Whether therefore ye eat, or drink, or whatever ye do, do all things to God's glory. Whether, then, you are eating or drinking, or whatever you are doing, let everything be done to the glory of God. Therfor whether ye eten, or drynken, or don ony other thing, do ye alle thingis `in to the glorie of God. 10:31 Therefore - To close the present point with a general rule, applicable not only in this, but in all cases, Whatsoever ye do - In all things whatsoever, whether of a religious or civil nature, in all the common, as well as sacred, actions of life, keep the glory of God in view, and steadily pursue in all this one end of your being, the planting or advancing the vital knowledge and love of God, first in your own soul, then in all mankind. 1Co 10:31 Whether therefore ye eat, or drink. The rule for eating and drinking is now given. It must be done all to the glory of God. This implies, (1) thanksgiving to God; (2) not doing what would put a stumbling-block in the way of weak brethren. To follow the Lord without the Holy Spirit is impossible, there for we must go to church and worship him and be fill with the Holy Spirit. Then we can do all things in the Glory of God. Glory be to Jesus. Whatever I do : I must be sure that it will give Glory to my God. I am to follow the example that Jesus left me to walk so as to please my Father and that He may be able to say unto me : Well done thou good and faithful servant. Jesus did all things for God 's glory, never forgetting that he represented and reflected the God whom He loved. We too want to imitate Jesus example.